Last week was a crazy one for me – six concerts in seven days, hitting 3 different states. In a way, the music on these programs represents a perfect cross-section of the types of collaborations that I value most, and I wanted to write a little bit about them. Sandbox will be at COTS on April 12th, performing the first world premiere the series has seen in its history: Spindrift by composer-in-residence Robert Sirota. Then on Wednesday, Sandbox headed to Original Music Workshop to play at a tax debate, of all things. First of all, if you haven’t yet heard of OMW, back up, click that link, and check it out. It’s a new concert hall and recording studio in Williamsburg that will officially open this coming fall, specifically designed to help emerging artists get their work out into the world. It’s run by Paola Prestini, a beautiful composer, and one of my favorite people in this world. The venue promises to be an incredible place to hear new music, and you should all go see a show there next season. Every time I come back to OMW, I’m amazed by how much progress they’ve made on the space. I’m so excited for the opening – please join us in October! Then Sandbox headed to our alma mater, the Yale School of Music, for a special performance on their New Music New Haven series. For each of these concerts, Yale invites a prominent composer to present some of his or her work, and the remainder of this program consists of world premieres by the graduate composition students. Bryce Dessner was the featured guest composer, and Sandbox performed 6 new pieces by: Krists Auznieks, Natalie Dietterich, Ian Gottlieb, Brian Heim, Michael Laurello, and Tiange Zhou. It was a pretty amazing experience. 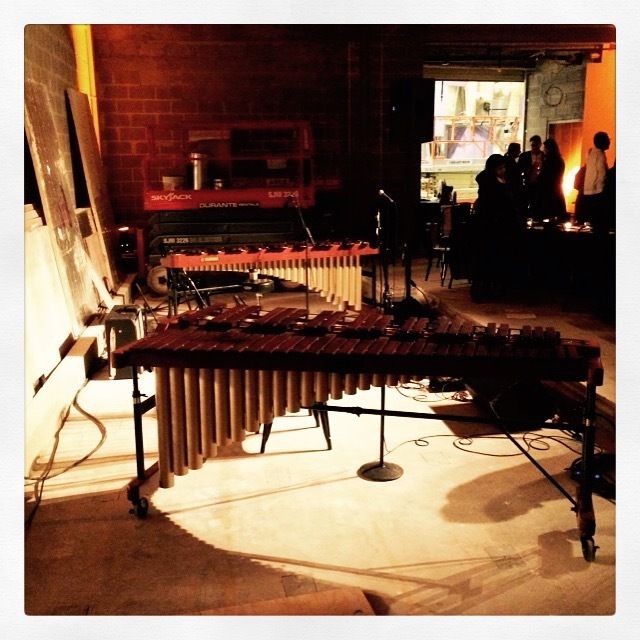 Each of the pieces that we received had a completely unique take on percussion – there was music for delicately bowed vibraphone, powerful drumming, and a piece that used nothing but 8 cymbals played in a multitude of ways. It was great to be back at Yale, but this concert was so meaningful for us because it is so in line with our mission to expand our repertoire. The future of percussion rests in the hands of this generation of composers, and to be able to work with 6 of them in this way was wonderful. That concert was last Thursday, which was the same day that a plane almost skidded off the runway at LaGuardia. Luckily, nobody was injured, but as soon as that happened, they closed all the NYC airports, and canceled every flight for the day. I was scheduled to leave very early Friday morning to get to Denison University for their biannual TUTTI Festival – and my first program with them was Friday night. Delta canceled my flight, and rebooked me on one that left Friday night – AFTER my concert was supposed to take place. All of this was happening in the middle of a crazy marathon of dress rehearsals at Yale, and I couldn’t step out to try to get on a new flight + Delta’s customer service line had a 3+ hour wait. Enter Ching-chu Hu, the organizer of the festival at Denison, who saved the day along with a few of his staff members. They somehow booked the very last ticket on another airline’s flight to Ohio Friday morning. It left from a different airport, and flew into an airport 2 hours away from where I needed to be….but at least it would get me to Ohio before my concert. It was an insanely tiring weekend, but totally worth it in every way. I woke up a little before 5, got to Newark in time for a 7:30 flight to Cleveland, was picked up (in this limo), and was whisked away to Denison, arriving only minutes after I would have had my original flight not been canceled. I jumped right into dress rehearsals for my first program that night, and performed 4 incredible solo pieces (by Andrew Cote, Jordan Kuspa, Tawnie Olson, and Steven Snowden) alongside performances by the Denison Symphony Orchestra and other faculty members. As soon as I finished, we headed over to a second hall on campus to set up for my program the following afternoon. Back to the hotel for a few short hours, and then back to the hall to get ready for performances of solo music by Ian Dicke, Mathew Rosenblum, and Conrad Winslow. Played the show, and then ran back to the first hall to have a dress rehearsal with ETHEL for our collaboration that night. 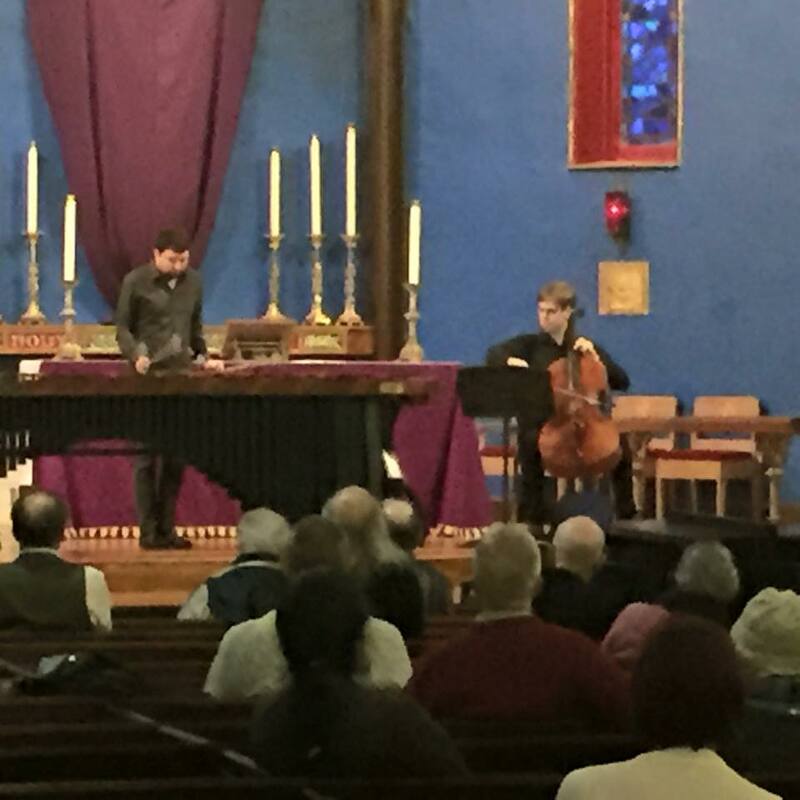 At this point, I’m nearly falling over, but luckily the only piece left for me to perform was Andy Akiho‘s LIgNEouS 1 for marimba and string quartet – a piece I have a passing familiarity with. Then I had the distinct pleasure of sitting backstage and listening to ETHEL shred one piece after another: each more interesting and played with more energy than the last. We finished the festival together, and it was without a doubt one of the more memorable performances of LIgNEouS I’ve ever given. The festival was such a good time. Incredible people, incredible art, and extremely supportive hosts. My only regret is that I didn’t have the time to see more of what was going on. Check out this video compilation of the whole week. It was an amazing week, but above anything else, I’m just so honored and thankful for all of the collaborators and artists in my life who work with me and help me do the things that I do. So thank you: Chewie, Cory, Dorothy, Kip, Ralph, Andy, Andrew, Conrad, Ian, Jordan, Mathew, Steve, Tawnie, Vic, Jonny, Terry, Chris T., Brian, Ian, Krists, Mike, Natalie, Tiange, Paola, Courtenay, Nat, Ben, Cryder and Jerry.